In the past few years a lot of (choose one: blood/tears/ink/spite) has been spilled over EPCOT, and seemingly also, strangely, recently rapidly receded. As if to coincide with the 25th anniversary of only a few weeks ago now, in preparation for the event the Disney fan community collectively reared up on their hind legs, their dignity affronted, and then........ Disney suddenly demolished the much hated wand and played vintage music out in front of the park for a day. And suddenly all the tension has dissipated. Although the removal of the wand is a huge first step towards admitting that there is a problem, EPCOT is still in the midst of a massive, crippling identity crisis. The past few administrative regimes have allowed laziness, cheapness, and - worst of all for the last gasp of real optimism about our futures in the 20th Century - post modern sarcasm to enter the EPCOT realm. Yet strangely all does seem to be good in Prototype Land as of this writing, and it is strange to reflect that the last serious bit of writing about The Place With The Big Golf Ball posted on this blog was made in March while we were still under the shadow of The Big Wand and on disaster watch for El Rio del Tiempo's successor. Well now the wand is gone but the relief of El Rio del Tiempo's awkwardly named successor not being a disaster has been heavily negated by an honest to god tragically awful new Canada circlevision film. A new head of EPCOT has been named, a museum has opened, and Disney has sold us an old-fashioned EPCOT T-shirt for twenty bucks. I say that now, before Spaceship Earth reopens as something possibly very different in March, while we're still feeling all warm and happy about the 25th, while the godawful wand no longer casts a long shadow over Communicore Center, and while the two best things about EPCOT - Food and Wine and Holidays Around the World - are in full swing... now, now is the time to begin to probe the question as to exactly what the hell EPCOT thinks she's up to. Let us, then, use this as a blueprint for attacking the Future World side of the equation. EPCOT sure has a lot of clutter strewn across her landscape these days: although the wand is gone, everywhere tiny things like water play areas, purple hot dog carts, neon, and weird netted canopies are flying this way and that. The Living Seas, which once had the most memorable entrance sign because of the waves crashing over it, a subtle but cool enhancement, is now strewn with those obnoxious birds from Finding Nemo. Areas which were once uninterrupted rolling hills of green and flowers have now had coffee carts plopped down in front of them. Useful but ugly big LED signs have sprung up all across Future World telling you not only wait time information, but things like the time and the weather that we're used to seeing on scrolling signs outside drug stores. It's not all bad and recently there has been in effort in the Communicore Central to reduce the amount of stuff that's there to pester you, but ill-fitting carts and diversions and whirlygigs still fill this area. In "An Aesthetic history of EPCOT" I spoke of how EPCOT totally eschews traditional modes of the theme park space, and I think the problem is that the People In Charge still haven't figured out that EPCOT, unlike Magic Kingdom, does not benefit from little pockets of activity you can stumble across. EPCOT's aesthetic is built right into her very buildings and walkways, and that is sleek, uncluttered lines and open spaces. You can't cover these up and the result of trying is to make these original design choices more, not less obvious to the casual observer. The act of having to look past the twirling whirlygig to see the bold primary shapes of Communicore just accents the disjunction. But let's take this seriously for a moment and say that the honest intent of these is distraction. This appears to be another effort to make EPCOT more like the Disneyland model: Magic Kingdom, where you can look anywhere and see something subtle and interesting, as on Main Street, relies on the methods of Stratification, where details pile up, one on top of the other, and recede apparently endlessly backwards into space, suggesting things which are not there. EPCOT Center is all surface: the details of the buildings scaled back until there are nothing but bold simple shapes which interest the viewer the way the intersecting lines of, say, Escher do. It is modernism, and I've called it Presentationalism before: here it is, it's all out in the open, this isn't detail, this is important. This is pure input. Stratification or Presentationalism. Oops, I think I've just named the two existent kinds of themed design...! EPCOT's Future World requires much more work to be a Stratification kind of park, it needs a lot more detail, many more structures, less open space, but it's what is being done and undone, so now we know it by a name. 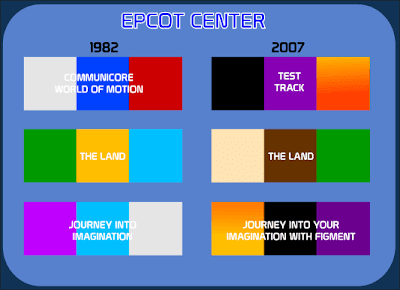 Above is a chart of EPCOT's main color patterns in three attractions of 1982 and 2007. What's important to remember about EPCOT is that Future World's main colors were silver and blue with accents of red; in 1982 Future World was a veritable concrete garden of white and blue and the dull green of florescent. Inside, blue and muted red carpets paved a path to better futures through Communicore and Universe of Energy and elsewhere; although many have argued about the merits of EPCOT Center's dual-park design, Future World is the best aesthetically integrated park ever built. Looking at the 1982 color tones above, it becomes clear just how muted everything was. Compare those sets to the 2007 sets to their right. If colors have been retained, they've been made bright and loud and attention hogging. Other colors have been added to downplay a "sterile" impression, generically warm colors like yellow and orange in stark contrast to the dynamic, uncompromised bright red which used to adorn Universe of Energy, World of Motion, EPCOT Energy Exchange, and others. The most prevalent color which has been introduced to Future World (and it's everywhere, from those Communicore Central awnings to stanchion poles) is purple, with bright orange a short step behind. Purple is traditionally associated with royalty, but also with uncertainty and madness, neither of which have much of anything to do with EPCOT. It could be an extension of the popularity of Figment, but I doubt it: probably intended more to harmonize with the current and most famous lighting scheme of Spaceship Earth, it misses the point totally. White and blue are the colors of the sky; purple and orange are colors of whimsy. EPCOT Center looked to the sky. The other major color to have infected EPCOT lately is black. It's more due to the dissemination of the concept that modernism can be represented in themed design through minimalism throughout WDI than anything else: all through Future World now there's big cavernous black spaces through once moved audio-animatronics, elaborate sets, and Presentationalist tableaus which better represented modernism than any amount of darkness. When I refer to Modernism we must remember that Modernism is not a movement which is producing much work today; confusion of "modern" and "current" is prevalent both inside of and outside of Disney. Modernism is a concept evolving as a rejection of Romantic values which rose heavily out of the work of Freud. Modernist art eventually mutated into things like Cubism and Pop-Art. Therefor, all things which are contemporary are not Modernistic (although, ironically, The Contemporary at Walt Disney World is Modernistic!). On the contrary, the prevalent cultural "ism" today is Postmodernism, buoyed by such self aware populist works as Star Wars. Although Minimalism is indeed a concept found in Modernism, it is not a concept which is productive in a theme environment (I talked about this in The Haunted Mansion in regards to Claude Coates). Nor is Postmodernism useful; witness California Adventure. But Minimalist Postmodernism flourishes throughout EPCOT today, an unhealthy combination of the two least conducive forms in theme design. While the outsides of EPCOT structures are covered with gaudy excesses of stuff, the insides are stripped away. There is no harmony anymore - in theory, content, color, design or even between the insides and outsides of attractions. Yet there are ideas at work here, just not the ideas the park opened with. Through color, through clutter, through (not entirely intentional) disharmony, Disney wants EPCOT to be a pleasure center, full of eye popping colors and spinning devices, places to get espresso (a contemporary sign of sophistication), and do interesting things like go into "space". It's more of a shopping mall with rides than anything. Which is ironic, because as shopping malls become more like theme parks and theme parks become more like shopping malls, a line must be drawn. Some malls around Central Florida are calling themselves "Town Centers", fully manufactured commercial downtowns plopped down in the middle of nowhere, or are billing themselves as 'culture centers" and get the local newspaper to write up little blurbs on famous citizens and put them on bronze plaques around the shopping plaza and throw lots of public art up everywhere. I think "culture center" is a fair assessment of EPCOT, certainly more fair than any billion dollar commerce zone. It is, however, different than the original meaning of the term, and it is different than "learning center", which is what EPCOT was originally more like. Which is ironic, because originally Future World was more like the theme park, with bad restaurants and good rides and generic stores, and World Showcase was your upscale mall with great food and great shops - EPCOT Center was the total package, your day of fun and your shopping spree and dinner out afterwards rolled into one. I sometimes call this period, not fully jokingly, EPCOT Center Apocalypse (A Go-Go). Yet the best and most profitable thing EPCOT has going for it today, The Food & Wine Festival, opened smack dab in the middle of this otherwise dreary period, in 1995. This suggests that there has been a concerted effort to make EPCOT... what's that word I just pinpointed? Ah yes. Sophisticated. After all, Post-Modernism's bubble hasn't burst yet (nay, we're right in the middle of its' hump), so things Post-Modern are seen as sophisticated. And so is having an appreciation of good food and spirits, coffee, and other things EPCOT offers you in abundance. If so, is it possible that EPCOT is attempting to carve out it's own kind of Neo Future Sophistication? It's a long shot from RCA's Home of Future Living, but it's there. So the question remains: is it working? Certainly, eating sushi while waltzing through a big flashy shopping mall of the future is kind of what people think is sophisticated, if the retailers and clientèle of the big soulless Mall at Millenia just up I-4 is any indication. Is it lasting? I'm not sure. Will it last us longer than Modernism lasted EPCOT, opened in the last possible moment before Post-Modernism arrived and sucked all the wonder out of our life? Perhaps... but in the future, we can probably expect a lot more of wining and dining out of EPCOT and a lot less of the attractions which made her famous. Hello! Welcome to a new feature here at Passport since I decided I didn't have nearly enough silly categorizations for topics like Park Mysteries, Vanishing Walt Disney World, Adventures in Master Planning, etc. So here's another one and this time I'll be exploring books, media, music, or whatever it is that doesn't directly relate to Disney but is useful/essential to understanding Disney product. It is my genuine, firm belief that if all you ever do to expose yourself to culture is that culture approved of by Disney, then your world view will be far narrower than any shared by any of the artists who created the Disney product we all know and love. Disney isn't high culture, but it isn't low culture either (something I've been trying to establish here for over a year now) and as such I genuinely hope to point the receptive spectator in the direction of related but challenging, exciting art which will significantly broaden the richness of the experience Disney offers. Sven Kirsten received much attention for his now semi-classic 2000 book The Book of Tiki, a huge celebration of all things Tiki Style in just 288 pages with a big, puffy cover. In it, he intelligently makes an argument for the 50's tiki revival being an inevitable and interesting part of American popular culture, despite being manhandled out of existence by a variety of factors. As such, what could come off as a chintzy exercise in cultural colonialism becomes an honest alternative to all the sour postmodernism, the sea of irony in which we float today. Tiki may have been silly, but he was all about fun and wouldn't slap your wrist for letting yourself believe in it for a while. Well Kirsten's next book has come out, Tiki Modern And The Wild World of Witco, and it's even better. Although many of the same concepts have translated over, they're articulated a good deal better and with a great deal less irony than his previous work, pushing the tome in the direction in more a direction of serious study (albeit this is this author's bias which will be self evident). 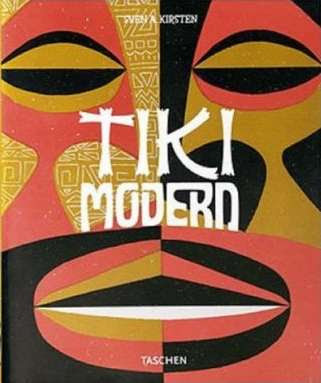 The tome is also much more narrowed in its' focus, not only delving specifically into aspects of popular culture which Tiki used in its' march through hearts and minds, but specifically addressing midcentury modern art manufacturer Witco, which used the revival of primitivism to transform these simple shapes of declasse Gods into beautiful, complex, yet always slightly gaudy flowing expressions of Modern art. When you look at prime examples of the Witco style, the best probably being the numerous bars which sometimes came complete with faux tiger hide furs, a sense that you're looking at something undeniably great but still cheap immediately comes to mind. And my God, the faces! If you thought the Haunted Mansion went overboard of the faces, wait 'till you see a Witco installation in glorious 60's Chintzy Color with an ocher shag rug floor - everywhere there's an unoccupied square inch of wood grain they carved a face right on it. Ultimately the book traces the entire evolution of the style, from the original South Seas gods to the Tiki revival of the past few years. He spends much time dwelling on the modernist transformations of Tikis from ugly, sneering wooden phalluses to flowing, comic, irreverent images of fun and whimsy that fans of Rolly Crump's Tiki Gardens Tikis will find much in common with. Ultimately this book is like a field guide to Disney's Adventureland style, a bizzare riot of authentic touches placed upon an architectural style gone totally amuck. Anybody who's spent a balmy summer evening in the Polynesian knows that the romance of the Tiki Torch is still very much alive there, and this book would be a perfect companion if it weren't so large and so beautiful you'd be afraid to leave the house with it! One of Kirsten's more revelatory asides is that the Tiki Temples (his name for a tiki bar) were often entered by crossing a footbridge as a symbolic way of crossing water and entering a fantasyland. Well guess what folks, in Orlando you not only cross a bridge to enter the Polynesian, but also a far smaller one to enter the Enchanted Tiki Room, a detail which the Disney designers probably repeated instinctually because it was so culturally ingrained. Reading the book and then visiting one of Disney's oasises not only makes you appreciate how rapidly Tiki subsided, how Disney built these Orlando installations in literary the last gasp of Tiki's hold on popular culture, how and why the Adventureland Style does what it does, and how rapidly later generations would corrupt it with more politically correct but less pure and innocent cultural styles such as Middle Eastern, a la Aladdin in Orlando's Magic Carpets and the bulwark of Paris' Adventureland. It's a beautiful book and if you're a long time admirer of mid century American primitivism like me, then it's a veritable pleasure cruise. The book, by the way, is published by the kings of graphical coffeetable style Taschen, and if you have interests in anything they probably have something they'd love to sell you. Taschen is like a big feast of wonderful, so be warned to imbide in moderation when you start looking through their site and adding books to your cart at $40 a pop. Since I have a lot of smaller pieces I want to do left in the ether I'm going to be posting them in rapid succession this week rather than stretching minor material out over a long period of time. So I'll be posting Friday also; be sure to check back late this week for more... stuff! Today we take a side trip out of Walt Disney World to visit the most important loss to the Disney community in a long time, and it's something nobody seems knows about. Yes, it's a movie theater. It's gone out of business, who cares? It's a movie theatre at the intersection of Lee and Orange and Winter Park, FL. Winter Park is one of the oldest communities in Central Florida, and the first to actually be a planned city. It features colleges, Northeastern style brick structures, and more. In short, it is the art and culture center in its' part of the state. Essentially, it'd be the place to let everybody in Central Florida know what you were up to in, say, 1966. 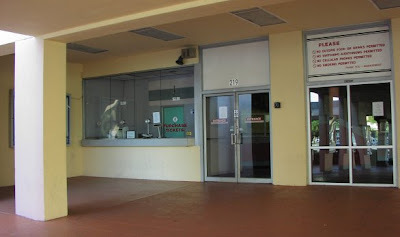 Here's a shot I took of the lobby through the closed doors. Look to the right there on the bottom... Yes, that's right. This is where Walt Disney's EPCOT film played in 1967. The theater and the area around it is today nigh-unrecognizable, having transformed into a multiplex by the 90's, and since fallen into vauge seediness. By the last few months it was one of the few second-run houses left in Central Florida, and tickets were dirt cheap. Then, suddenly, it was gone. It's going to become a Lifestyle Fitness Center soon; be sure to stop by sometime and pay your respects. Since I have a lot of smaller pieces I want to do left in the ether I'm going to be posting them in rapid succession this week rather than stretching minor material out over a long period of time. So I'll be posting Wednesday and Friday also; be sure to check back late this week for more obsessive minutia! I've also posted an index section in the navigation bar to the right; is this remotely useful? Usually I use Vanishing Walt Disney World here to bemoan small-to-medium losses, but this one is starting to verge on trivial if it weren't something I was actually rather fond of. 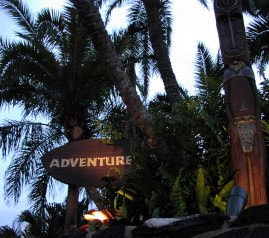 It (was) the little oval sign to the right of the Adventureland bridge to the hub. There it sat for many years in a little circular planter embellishment to the pathway, with a few angry Tikis, utterly redundant in that you'd be more likely to notice the big bamboo Adventureland arch than her little wooden oval cousin nearby, but it made sense in a perverse way because it seemed to announce, dammit, that Adventureland was the only land cool enough to have two signs! Recently, as I've been told, it was discovered by maintainence and/or WDI that the sign was actually installed during a refurbishment to the gate during which the actual Adventureland sign went missing for some time. The little wooden sign was installed to help any potentially confused guests in finding their way towards such exotic delights as Tropic Toppers or The Magic Carpet (the store, not the spinning ride with the camel). After the refurbishment was done the other sign was never removed and, as such, Adventureland had a dual-sign system which was deemed silly this year, the extra sign was removed and screwed to some wall somewhere backstage (this is what happens to old park signs incidentally). This temporary nature explains something with actually bothered me for years, which is why the sign was only half finished: the embellishments around "Adventureland" were carved, whereas the text was merely painted. Really, that bothered me to no end. It's pretty hard to argue that it's a major loss, but just another minor loss in a land which has suffered a crippling epidemic of minor losses: Elephant Tales, Traders of Timbuktu, the barker birds for both Pirates of the Caribbean and the Enchanted Tiki Room, The House of Treasure, Lafitte's Portrait Deck, the Caribbean Plaza fountains, the Castillo del Morro roofline cannons, the Jungle Lookout atop the Swiss Family Treehouse, the torches throughout the whole land.. are there any others? Oh yeah... the Adventureland Veranda. It's a wonder there's any character left in the land at all, to be honest. Anyway it's gone now, and it was cute, but hardly important. What's interesting is that the tikis flanking it remain behind, which gives the entrance an interesting dynamic in that they are no longer literal embellishments of the sign but moodsetting pieces pushed out beyond the land itself, the first sign of wilderness as you leave the civilization of Main Street. Because you wanted it, and because Mike Lee of Widen Your World graciously provided it, here's an interior layout of the beloved Columbia Harbour House complete with the original room names! I've been told that there were once small signs naming each room, which is possible, but I sure don't remember it. What is included on this map which is of note, however, is the second floor kitchen which still exists, but has been walled in. Also, note that the divider between the Foyer and the Chesapeake Bay room was removed earlier this year to expand waiting space. Although it was a bottleneck, it was a charming bottleneck, and now it feels less like you're entering a real inn and more like you're inside a food court. Oh well. Click to expand. Image is (c) me 2007. Please do not redistribute. One question that was posed to me by a friend of mine (who has been visiting Walt Disney World for as long as it has been around) recently was whether or not Walt Disney World ever had a dead settler outside its' burning cabin, just as Disneyland had for many years. I admit I don't have much on this, but it frankly does make sense - Magic Kingdom was put together by the same good folks who had put together Disneyland and of course the Californian dead settler was a part of the scene which was replicated in Florida, so there'd be no reason why Florida didn't have her own scene of Frontier carnage at some point in time. The problem is, there seems to be practically no evidence supporting this besides the memories of those who were there. Below are two souvenir slides from 1971 showing the Florida burning cabin; followed by another shot from 1969 showing the Disneyland version for comparison. As you can see, the structures are practically identical; as a result, there probably are photos of the Florida burning cabin circulating through the Disneyana circuit being misidentified as the California version. The Florida version has a different split-rail fence closer to the cabin and has a different grassy slope in front of it. And, as is easily seen in those 1971 photos, there is no dead settler. Hold on; there's an extra twist. Left is a portion of a 1971 Walt Disney World slide showing the Alligator Bayou shed show scene still in place alongside the river today being passed by a keelboat. The important thing is that there isn't the "Beacon Joe" animated figure that's currently in place to the left of the shed, and probably not the Marc Davis dog/jumping fish gag (although we can't tell since the keelboat is in the way). So if Beacon Joe's shed but not Beacon Joe was there in 1971, why wouldn't this follow suit with other Rivers of America elements, like the plastic animals or.. the dead settler? The Settler’s Cabin burned for more than four decades on the north end of Disneyland’s Tom Sawyer Island. However, the story changed several times. In the 1970s, the entertainment industry became increasingly aware that their often simplistic portrayal of American Indians could be offensive. At Disneyland, the settler lost the arrow and became the victim of evil river pirates. In the mid-1980s, the settler became a moonshiner whose still had exploded, igniting the cabin. The moonshiner was sprawled out in front of the cabin, but we were assured he wasn’t dead; he had just consumed too much of his product. I've spoken to some long time Orlando visitors who have never been to and know nothing about Disneyland and who remember the drunken moonshiner; also, let's not forget that the River Pirate plot was already existent in Florida what with its' Pirate's Cave scene around the other side of the island; so at some point either or both of these stories were in place in Florida. Until the burning cabin's flames were extinguished in Orlando in 2005 with an extended refurbishment to the Riverboat (the lines are still there; it could burn tomorrow if park management didn't think that propane was too extensive), the Riverboat recorded narration still spoke of river pirates having set the cabin aflame. I've posted a transcription of the Keel Boat narration from 1994 which mentions the moonshiner story in a way, so it's possible that depending on the attraction you rode, you got a different story! If anybody has a picture of our MIA settler from Orlando (check the split rail fence for confirmation! ), I'd appreciate confirmation of this long-standing Park Mystery. I know of a lot of other people who would appreciate it, too! Thanks to the always lovely Daveland for allowing me to post some of his collected photos!